parc familial de natation et de pique-nique; trois petites épiceries, 2 stations-service, une bibliothèque, 7 restaurants, un salon de coiffure, un parc pour chien, un port de plaisance, une piste de ski de fond et des sentiers pédestres, un sentier de VTT, une promenade en bord de plage, un magasin d’alcool, une banque. 30 minutes du centre-ville de St. John. Autres commodités incluent: ski de fond, raquette; jouer au golf; voile; sentiers de randonnée; églises, pêche à la mouche; Pique-nique au parc familial Holy Cross, piscine pour enfants et baignade en toute sécurité; Taï chi; les pharmacies; dentiste; cabinets de médecins; cliniques médicales; les stations-service; programmes pour personnes âgées; festival de calmar, carnaval de cristal d'hiver, programmes pour enfants; promenade, baleines, dauphins, pêche à la morue, phoques, observations de mer inhabituelles, aigles, faucons, huards et observateurs d'oiseaux, Centre de formation marine de l'université Memorial, parc naturel de Salmonier, ski de fond T'Railway Boardwalk, July Squid Fest, (festival de musique et de danse communautaire qui dure cinq jours et qui attire des gens de tous les horizons), regorgeant d’événements pour tous les âges, légions, clubs, pubs, Tim Horton's, pizzas, restaurants Subway et Mary Brown's, beaucoup de myrtilles et de champignons pour la cueillette. Pour les artistes, les photographes, les réunions et autres groupes ayant besoin d’un lieu de rendez-vous pour travailler ou discuter, vous trouverez un beau grand studio lumineux à quelques pas de la rue, disponible à la location pour 50 $ par jour. chevalets. We had an excellent experience at this property and I highly recommend it. Gail was easy to work with and the booking process was smooth. The house was well stocked so it required very little purchasing of supplies outside of our main meals. It was quiet and on a lovely property with amenities nearby. There was a beautiful boardwalk with great views just 10 mins away from the property. We had 2 1-year olds with us so we were happy to be in a quiet area. Beware: there are two Bennett's Roads outside of St. John's so be sure to pick the one specifically in Holyrood! Would definitely recommend this property! We had a wonderful stay at this property.It had everything we could have needed. Fully equipped kitchen had everything you would need. The location was perfect for our day trips.Beautiful view of the bay from the back deck, waterfall on the property it was relaxing and homey! Would highly recommend this property! Owner was wonderful and welcoming! Our family of four stayed at this property in August for 11 days. My husband is from Foxtrap but this year we wanted space of our own so decided to rent this house. It was wonderful! There was plenty of space for our family and having two bathrooms was fantastic! Although not a new house, there have been plenty of updates and we appreciated the nice kitchen appliances. We hosted a birthday supper with 13 adults and 6 kids and everyone raved about the beautiful view and quiet location. All the kids played in the yard, explored the falls, played on the swings and had the finished basement to just hang out. We enjoyed the deck and lights shining on the water at night. Having laundry onsite was great as well. Gail was wonderful and so helpful when we asked if she had a radio. One was brought over for our use and it was a clock radio/alarm. Gail is such a friendly, lovely lady! We would definitely stay again!! We loved our stay. Loved the small falls, but couldn't locate two others on the property. The view of the bay was an added pleasure. The house is located on a quiet and very private property. It was close to the highway we needed on our daily jaunts. The restaurants were within walking distance if you choose to walk. There was a washer and dryer so no searching for the laundromat. We definitely recommend a stay here . The only thing missing was an alarm clock in the bedrooms. We had a wonderful stay at this Holyrood property. This location suited our purpose as we were attending an important function further up Conception Bay. It was also close enough to do some daytime site seeing in St. John's. The property is large and we enjoyed the view of Conception Bay and the beautiful creek that runs through nearby. The house is back enough from the highway and so it was quiet. Restaurants, gas station and grocery stores are all close by. The owners were very friendly and even greeted us on our arrival and checked up occasionally during the week to make sure we were comfortable. The rooms are modern and clean. I would highly recommend this place. My business takes me to many places around the world. When a recent project I had took me to Holyrood I was looking for accommodations for an extended period of time. I was able to find a single family home through VRBO that was exactly what I was looking for. 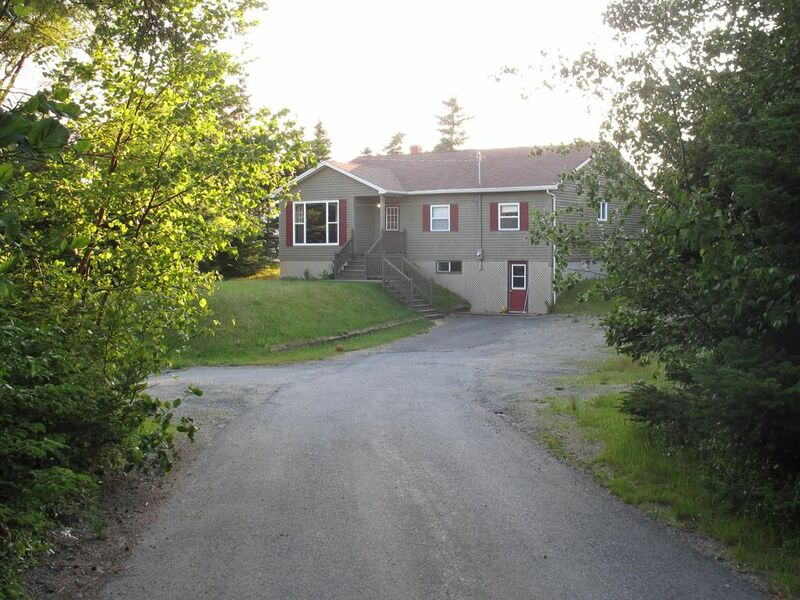 The property is situated with a nice view of Conception Bay from the back of the house and a wonderful creek and waterfall in the front yard. The house is very nicely appointed and was also in close proximity to the project. The house is within walking distance of the harbor and there is a walking trail in the back of the property for those who enjoy the outdoors. I would highly recommend this house to anyone who enjoys quiet, privacy and nice views. Besides the house meeting all my needs the owners were very warm, open and generous with their hospitality. They were a big reason that I enjoyed my stay so much. They were able to help me become familiar with the area and made me feel at home during my time in Holyrood. If you are looking for short term or extended stay, you should consider this house. Presque tous les éléments suivants sont à distance de marche: Ski de fond; Faire de la raquette; Golf; Voile; Sentiers de randonnée; Des églises; Pêche à la mouche; Holy Cross Family Park Pique-nique, piscine pour enfants et Baignade; Taï chi; Pharmacie; Dentiste; Les cabinets de médecins; Cliniques médicales; Les stations-service; Programmes pour les aînés; Festival de Squid; Cristal Carnaval; Programmes pour enfants; Boardwalk, baleines, dauphins, phoques, Insolite Mer vif, aigles, faucons, les plongeons et observation des oiseaux, Marine Training Centre Memorial University, Salmonier Nature Park (un grand parc naturel avec une promenade pour regarder les animaux sauvages blessés secourus); Marcher T'Railway; Motoneige; VTT; Beach Boardwalk; Juillet Squid Fest (un festival de cinq jours de communauté qui attire les voyageurs de partout dans regorge d'événements pour tous les âges); Clubs de la Légion; Coiffeur; Pubs; Boulangerie; Pizzeria; Épicerie fine; Mary Brown; Métro; 4 Famille & Beaux gastronomie Restaurants dont un magnifique jardin de thé. There is an additional fee of $25 per person per day beyond 4 people. The house has an old septic system, so in order to avoid plumbing problems we ask that only heavily soiled toilet tissue be flushed down the toilet, and all else be put in the provided garbage bin. The house should be left in the same order as it was when you entered - eg: floors clean; dishes washed, cupboards, counter tops and tables clean and tidied. Used bedding and towels can be left where they are for us to wash. We are not responsible for loss of your personal property regardless of how the loss occurred, nor are we responsible in any way whatsoever of any injuries or death by any means whatsoever to any person renting or associating with you while in or on our listed VRBO property #561547.